Chateau / Country House2798 sq. ft.
Finca Iris is located on a large plot and is directly adjacent to nature. No neighbor far and wide. As you walk through the very stylish and cozy living room, you immediately reach the dining room, from where you have direct access to another wonderfully shaded terrace and porch. 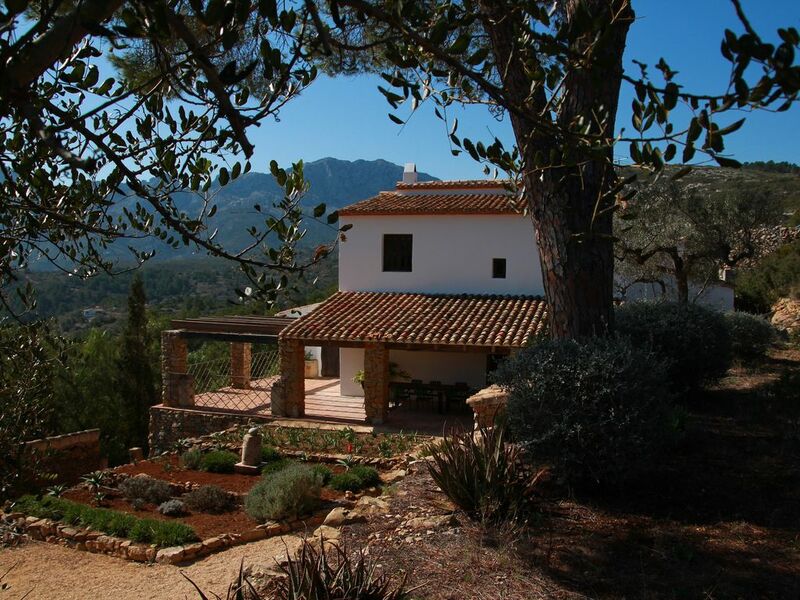 From this terrace you have an incredible view of the Sierra de Bernia and the valley where the Finca Iris is located. The open kitchen is connected to the dining room. In the living room there is a staircase that leads to the two bedrooms. One of these bedrooms has its own large balcony across the entire room width and a wonderful view of the nature and mountains that surround you. The other bedroom is very spacious with a large rustic wardrobe. The bathroom is located in the hallway and has a bath, a double sink and a toilet. The other bathroom with walk-in shower is located on the ground floor. A beautiful farm in a fabulous location! We had a great time! Thank you very much Antoine & Friends it was a joy to have you all here! Good luck overthere with your beautifull Horsemanship project! Holiday House Finca Iris is located in the province of Alicante on the Costa Blanca, 8 km (20 minutes by car) from the main road Benissa-Calpe (N332) and about 55 minutes drive from Alicante. Valencia is in the opposite direction, about 1 hour by car. The beach is 30 minutes. According to the World Health Organization report, this area has the healthiest climate in Europe. With an average of 17 degrees in January, of course, this is fantastic. Even in winter, temperatures can reach 20 degrees during the day. The 'biological' winter lasts only 3 months and spring begins with the almond blossom in February. 'Sierra de Bernia' is a small mountain chain that stretches inland up to 20 km into the hinterland of the Costa Blanca, which is not affected by mass tourism and is protected.